15 Responses to Happy Birthday, Jeff! 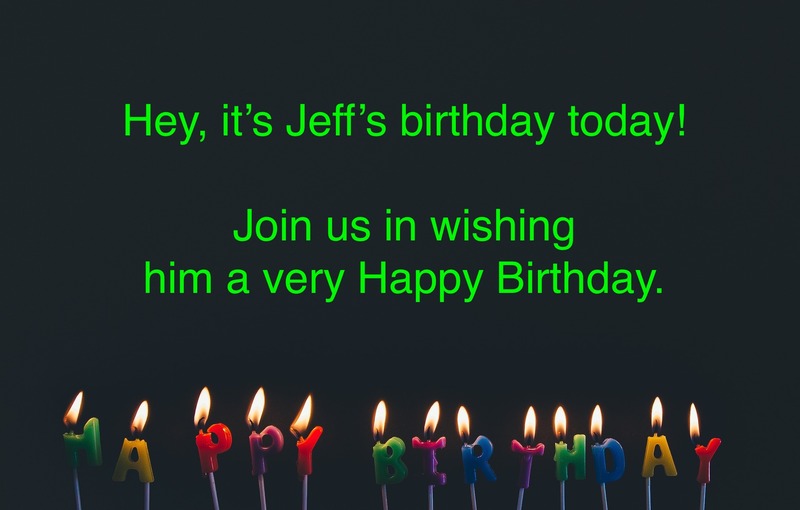 “Hey, it’s Jeff’s birthday today! With colourful burning candles below, displaying the words “HAPPY BIRTHDAY”. HAPPY BIRTHDAY JEFF! And HAPPY 10th ANNIVERSARY yesterday to this blog! I wish you all who happens to see this message a happy everyday as well! Congratulations from a long time listener in Norway! I really miss the dialogues you and Lucy performed. But I have lots of dialogues in my archive. has and why not with his family too. HAPPY BIRTHDAY JEFF dear professor and friend. any news from Norway, and another from…..? between Jeff and Lucy so they are with me always. So Lily you never leave us at all? That´s good, next journey I could do will be to Hong Kong…..
boy and his girl friend from Norway. He was twice tall than me and I am 1,76 m tall………so? It was very funny when I asked them, how do you manage? Laugh a lot about the question. Why are you not going to Oslo? they said to me. Next trip I replied them. I’ve learned a lot from your great explanations and comments in all the podcasts. I appreciate them much. Congratulations! Happy birthday, thanks very much. Thanks to all of you for your kind birthday wishes. It was especially nice to hear from some “veteran” listeners – thank you very much. Glad to hear you are all still well. Although, passed a certain age people -and by people I mean me -:)prefer avoiding their birthday than celebrating it. A huge fan of you and ur brain child -that is -our one and only eslpod. And it is not socially sound to be the bearer of a bad news in the midst of birthday wishes and festivities. The founder of play by ” Hugh Hefner “died at the age of 91. He indeed , championed a new era at the time when even saying the word ” pregnant” on tv productions was deemed taboo. He turned an illicit subject into a multimedia industry and in time slid it into mainstream dialogs. I personally think, the idea he touted through 3/4 generations encouraged and empowered women to express themselves. He was revolutionary and at times controversial. Happy birthday, Jeff! I’m from Russia. I’ve been listening to your podcasts and reading the blog for many years. Today I dared to write here. I’m sorry I hadn’t downloaded the podcasts, I thought they would be always available. I was so wrong. But anyway, happy birthday to you and thank you for your job!